12-0 and 0-7; quite striking results! The news of the four Hen Harriers which disappeared mysteriously on grouse moors in Scotland is shocking. That is, shocking in the sense of morally reprehensible rather than really rather surprising. As I mentioned in my earlier blog, an interesting aspect of this news is the revelation that 12 young Hen Harriers have been discovered dead, with their transmitters transmitting (as would be expected) and their remains have been collected and analysed and we know that they died of natural causes. Of this year’s young birds (where I do not think we know how many satellite tags were deployed except that it was a record and high number) that means that 12 have died of natural causes with their transmitters still working, and 7 (four in England and 3 in Scotland (the 4th Scottish bird was hatched in 2017)) have disappeared (their transmitters have stopped transmitting). Seven out of the seven ‘disappeared’ were last recorded on or near driven grouse moors; all seven of them. So I was interested to know how many of the 12 were found on or near driven grouse moors. Let’s imagine that all 12 were found on grouse moors – that would stuill be interesting. It would mean that all birds that can be recovered on grouse moors die of natural causes but that there is a large category of birds who also disappear on grouse moors (or near them) but whose bodies, for some reason, are not available for examination. That would be interesting in itself. But let’s imagine that half of the 12 were picked up on grouse moors and the other half were not – that would be interesting too. It would mean that birds dying away from grouse moors always seemed to die of natural causes whereas Hen Harriers sometimes died of natural causes on grouse moors, but rather a lot of them ‘disappeared’ and their bodies could not be recovered on grouse moors. It’s fun imagining, but the RSPB must know the answer so I asked them. I asked how many of the 12 young Hen Harriers dying of natural causes this year were picked up on grouse moors. And the answer is ‘none’. None! Not one! Zilch! That is a fascinating fact. 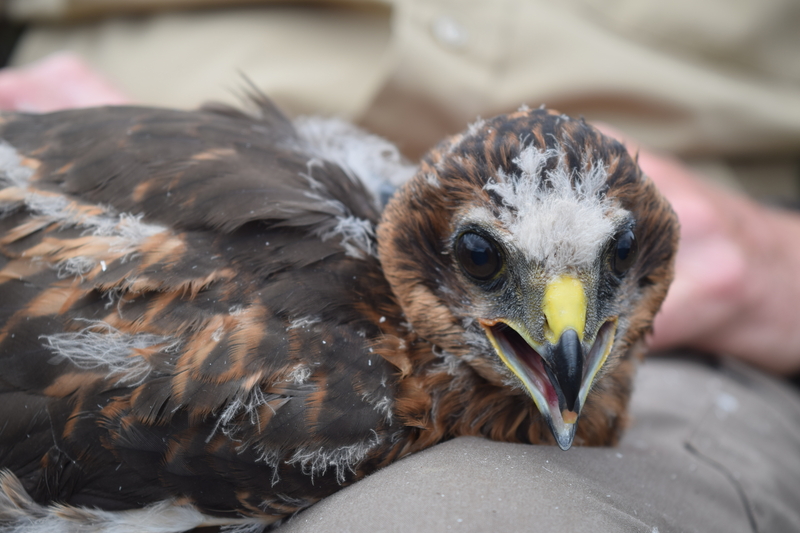 So of the 19 young Hen Harriers which have either died and been autopsied or ‘disappeared’ mysteriously, not a single death from natural causes occurred on a grouse moor and not a single ‘mysterious disappearance’ occurred anywhere other than a grouse moor. 12 – 0 and 0 – 7. Fairly remarkable scores, don’t you think? What would also be interesting to know would be the dates on which the 12 died. The 8 that "died" in or around grouse moors all mysteriously disappeared during the grouse season. It may be that this is the time of peak natural mortality but it would be interesting to know. Perhaps your ex colleagues can enlighten us? If that is accurate, it is incredibly damning. A very interesting observation, but not much of a surprise unless you work as a gamekeeper, for the media or own an estate. At the end of the year, If we do not know the total number of tagged birds we can, if we assume a survival rate of we can see how successful the people who are ensuring the birds do not survive have been in keeping the skies free of Hen Harriers. It must be appalling for the staff and volunteers who worked so long to ensure that the young fledged. It also shows that Hen Harriers do have the capacity to recover numbers. I thought there were nine sat tagged birds missing presumed killed? Athena, Margot, Stelmaria, Heather, Hilma, Octavia, Huelwen, Thor and Mabel. Prasad - seven of them fledged this year and were tagged by RSPB (and therefore are comparable with the 12). Aren't the odds the same as tossing a coin 19 times and each time it is heads? Prasad - no, it isn’t because we don’t know how much time the birds spend on and off grouse moors so we don’t know that it is 50%. And it is more complicated than that in any case. The analysis is quite complicated (particularly without the ranging data!). Yes of course. Stupid of me. But surely it is possible to calculate at least roughly. I leave this to a mathematician. My simplistic brain says, and I'm probably wrong, that if the birds were spending more than 50% of the time on grouse moors, which i would expect, then the odds i gave would be a minimum wouldn't they? Praasad - we'd need a lot more information to calculate anything but 12-0 v 0-7 is likely to be very striking whichever way you look at it (which is why I wrote this blog). It was pretty good fake news from me though? Prasad - you're thinking along the right lines but we don't have enough to do the sums. And they would be quite difficult sums to do anyway. Of course as Mark says you could apply a more sophisticated parametric approach to analysing the data if you knew the amount of time spent on grouse moorland versus time spent elsewhere. Mike - many thanks. I do love it when people do probabilities on this blog! I think i can answer my own question the 19 birds Mark refers to are RSPB birds. I was talking to Christine Robertson (NE) on the phone today about the lack of release of the sat tagged data specifically the Bowland birds. I have now written back to her to release this years data to see if the odds are in the billions to one or googols to one. Prasad - yep, RSPB birds fledged this year. Prasad, Bowland birds these days are tagged by, or at least for RSPB as there are no longer( so far) successful attempts indeed attempts at all on the private estates where one assumes NE will tag them. For the grouse lobby this is very very damning, shame this government doesn't seem to be paying attention. I am intrigued to see how the Moorland Association, GWCT/Andrew Gilruth and their friends will explain these ratios. I know in advance I’m going to need a hard hat for this reply but if you are a keeper or estate employee and you find a dead bird of prey on your patch with a transmitter what’s the most logical thing you’re going to do given the levels of mistrust on both sides of this conflict ? Supposition I know but then I’m in good company on that. Julian - report it and get an autopsy - particularly if you have a clear conscience and don't mistrust any of your workmates or neighbours. Some gamekeepers have reported such finds and my recollection is that they have been praised. Doesn't seem to happen with hen Harriers in the uplands very often though. I believe that if the bird died and was subsequently found by an estate worker who 'given the level of mistrust' decided to destroy the tag, then the pattern of signals from the transmitter would very likely show that something of the kind had happened unless the bird was found almost immediately after it died. I don't think your suggestion is a very plausible explanation for the observed pattern. We can't even get prosecutions launched against wildlife criminals videoed in the act! You really think a gamekeeper would fear getting hauled in by the police if they just found a dead raptor, recovered the body and transmitter and actually reported it to the police! You really think those sensitive gamekeeper types give a damn about their reputations amongst anti-shooting local residents! Wow! You have a point but you would have to have the data.